Logistics space in India has seen tremendous growth in India over past few years thanks to rise in online shopping. Many new logistics players have cropped up to fulfill the demand created by eCommerce companies. These new logistic companies are mostly startups or offshoots of traditional large courier companies. Now, we have a $16.9 billion Mahindra Group entering this space – They have today announced the launch of SmartShift – a technology enabled load exchange platform for cargo owners and transporters, enabling them to work closely with each other. Cargo owners (both businesses and individual users) can access the SmartShift service through a mobile app (currently available on Android), the website or the dedicated call centre. The mobile app enables users to find cargo transporters based on the shipment size, weight and other requirements. the user can negotiate as well as finalize the deal on the mobile app itself. Simply put, Smartshift provides a common platform for cargo owners and transporters to get the best logistics deal! 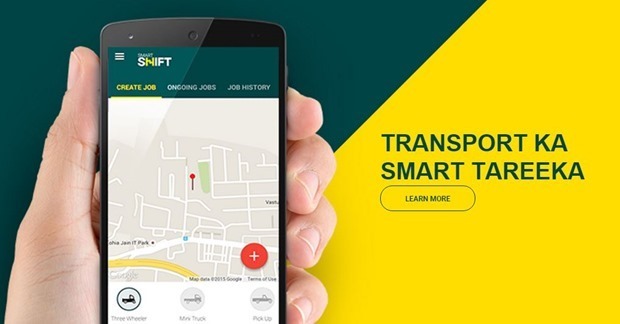 Cargo owner first needs to ‘create a job’ on Smartshift app, which involves providing date of cargo pickup, starting point, destination, type of goods and other details. The user can choose whether they want a ‘Open-body’ or ‘Closed-body’ vehicles for their cargo. For payment of goods, the app offers 3 options including ‘payment in advance’, ‘Cash on Delivery’ or ‘come back for payment’. SmartShifter or the transport owners will need to be registered on Smartshift platform to start accepting the jobs. Any individual or company who has a small commercial vehicle or fleet of vehicles can register as Smartshifter. The registration involves training, document collection and verification along with certain other processes. Once the Smartshifter is registered on the platform, when ever a Job is created, they will get immediate intimation on their mobile phones. They can choose to accept the jobs which they are comfortable with. Smartshift app charges 6 percent commission from the transporter, which is automatically deducted from the account balance at the beginning of the job! Check out Smartshift introductory video that gives you an overview of the service. In our view, Smartshift is a great platform and has potential to disrupt and democratize logistics space in India. "Mahindra Launches SmartShift, a Mobile App Connecting Transporters To Cargo Owners", 5 out of 5 based on 1 ratings. UI is not upto mark, not something you would expect from Mahindra.